Bif Antibody is affinity chromatography purified via peptide column. BIF antibody was raised against a 15 amino acid synthetic peptide from near the carboxy terminus of human BIF. Bif Antibody is supplied in PBS containing 0.02% sodium azide. Bif antibody can be stored at 4 degree C for three months and -20 degree C, stable for up to one year. As with all antibodies care should be taken to avoid repeated freeze thaw cycles. Antibodies should not be exposed to prolonged high temperatures. Small volumes of anti-SH3GLB1 antibody vial(s) may occasionally become entrapped in the seal of the product vial during shipment and storage. If necessary, briefly centrifuge the vial on a tabletop centrifuge to dislodge any liquid in the container`s cap. Certain products may require to ship with dry ice and additional dry ice fee may apply. Bif Antibody: Apoptosis plays a major role in normal organism development, tissue homeostasis, and removal of damaged cells and is caused by the activation of proteolytic enzymes termed caspases. Proteins that comprise the Bcl-2 family such as Bax appear to control the activation of these enzymes. Bax activity was found to be regulated by its association with Bax-interacting factor 1 (BIF), a member of the endophilin B family that is associated with intracellular membranes. Following this interaction, Bax undergoes a conformational change and translocates to mitochondrial membranes. The Bax/BIF interaction appears to be enhanced by apoptotic stimuli, suggesting that BIF acts as the trigger to activate Bax, and as suppression of BIF promoted HeLa cell colony formation in soft agar, it may have a role in the suppression of cancer progression. At least two isoforms of BIF are known to exist. 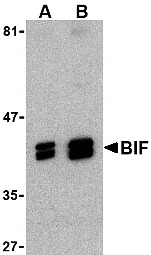 BIF antibody can be used for the detection of BIF by Western blot at 1 - 2 mug/mL. 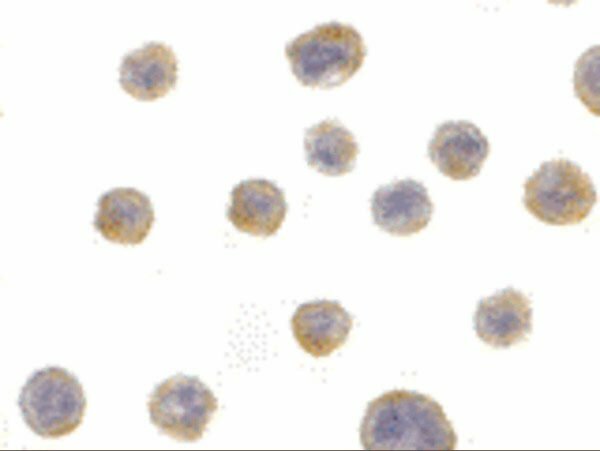 Antibody can also be used for immunocytochemistry starting at 10 mug/mL. Western blot analysis of BIF in HeLa cell lysate with BIF antibody at (A) 1 and (B) 2 μg/mL. Immunocytochemistry of BIF in HeLa with BIF antibody at 10 μg/mL. NCBI/Uniprot data below describe general gene information for SH3GLB1. It may not necessarily be applicable to this product. SH3GLB1: May be required for normal outer mitochondrial membrane dynamics. Required for coatomer-mediated retrograde transport in certain cells. May recruit other proteins to membranes with high curvature. May promote membrane fusion. Binds DNM1, HTT, AMPH, BIN1 and ARFGAP1. Homodimer, and heterodimer with SH3GLB2. Binds BAX. Induction of apoptosis augments BAX binding. Highly expressed in heart, skeletal muscle, kidney and placenta. Detected at lower levels in brain, colon, thymus, spleen, liver, small intestine, lung and peripheral blood leukocytes. Belongs to the endophilin family. 2 isoforms of the human protein are produced by alternative splicing. 1. Data suggest that activated autophagy is associated with the progression of pancreatic ductal adenocarcinoma and that the overexpression of autophagy-related proteins Atg5, Ambra1, beclin-1, LC3B and Bif-1 is significantly correlated with poor outcome.